Pelosi Fying Circus. What About the Carbon Footprint? Abuse of Power? Democrat Speaker of the House, Nancy Pelosi, now demands a free jet. Ever hear of conference calls? Hillary’s big guns are holding back from advising Pelosi. I have a new theory, I think that Pelosi is being sabotaged by the powerful elite in the Democrat party. Image mistakes like this can easily be avoided with a little brainstorming. I think that having Pelosi around hurts Hillary’s chances. Not even moderate Democrats want to see the total government run by Prorgressive Democrats. In a new world of face-to-face conference calls, Blackberries, online chats from all over the world on Skype, Macs and many other devices, the new Democrat Speaker of the House, Nancy Pelosi is asking for her own government jet to fly her and her friends around for meetings. Can you imagine the outrage in the media if Newt Gingrich had demanded his own 747-200 passenger jet? I can. Page one stories all week. The excuse Pelosi is using now is that she just wants a plane that doesn’t have to refuel. Question, don’t most smaller aircraft sometimes have to refuel, including the president’s plane? Question 2) Doesn’t Pelosi own a brownstone mansion in Georgetown? Why does she all of a sudden have to shuttle back and forth the California? During the same week that Nancy Pelosi and the Democrats are pushing for a bill that states “It is not in the national interest of the United States to deepen its military involvement in Iraq…” she is demanding a military 747-200 for her use. I think the jig is up. Now she is DEMANDING (and by demanding we mean having John Murtha send threatening phone calls to the administration) to be given a military aircraft that is the equivalent size of a commercial 757. Evidently having the old small plane that Dennis Hastert had occasional use of was not enough, nope — she wants Air Force One – without the Oval Office. Room for her friends and lobbyists? And what would Al Gore say about the amount of fuel she would be using? “TunaGate” was a reference to Democrats exempting American Samoa from legislation to increase the minimum wage. Star-Kist Tuna, whose parent company Del Monte Corp. is based in Mrs. Pelosi’s district, had lobbied against the wage increase. Nancy Pelosi has unleashed her clueless, elitist, and out-of-touch inner-limousine liberal and allowed it to run free. First it was her recent demand for private use of an Air Force jet for trips to California not only for her, but her staff, delegation colleagues, family friends, and generally anyone else she likes. Now, in a moment of irony so rich it should carry a diabetes warning, we learn that she will be going to tomorrow’s Congressional hearings on global warming in a Chevy Tahoe. It’s amazing to contemplate, but I do believe she has a political tin-ear bigger even than Hillary’s. 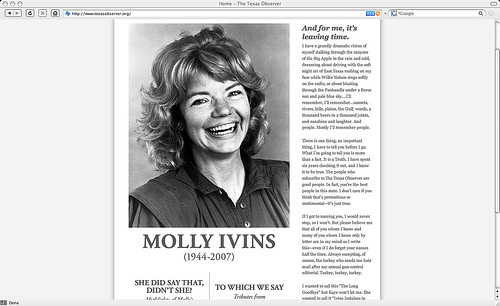 Molly Ivins — The Texas Liberal Icon Has Died. Get Ready for the Mother of All Obits. Updated. Molly Ivins was the Texas Democrat party’s biggest supporter for 40 years. Newspapers always deliver big obits of their own, but when they are uber-liberal “celebrity” columnists, get ready for a state funeral pageant. Although the press is fond of labeling FOX News journalists and nearly all Republicans “right-wing,” they rarely call even the most liberal journalist or Democrat left-wing. But not so for Molly Ivins. Ivins was a self-described leftist agitator. She made her living as the Texas Democrats’ pit bull. Every day we have seen more updates on the late Molly Ivins. The journalists who have “touched her robes,” or sat at her feet and heard her anti-Reagan, Bush bashing, Arnold scorn (she said he looked like a condom filled with walnuts) one-liners. James T. Campbell, at the Houston Chronicle, had his little brush with famous Ivans when she volunteered to speak at a conference of the National Association of Black Journalists. (One has to wonder about associations based on skin color). For nearly 45 minutes, she captivated the audience with her salty humor and delicious tidbits about Texas politics and politicians. She saved the day. She was my heroine. Read “The Mother of All Obits,” today in your daily newspaper. In The Houston Chronicle, she gets front page play today, a 2-col. photo with a jump to page four, about 80 column inches with “pull-quotes” and photo of her as an “intern” with the paper in 1966. “I’ll remember sunsets, rivers, hills, plains, the Gulf, woods, a thousand beers in a thousand joints, and sunshine and laughter. And people…Mostly I’ll remember people.” — her farewell column to Texas Observer readers in 1976, when she took a job with the New York Times. Andy Ivins, brother to late columnist Molly Ivins, recalled his sister smashing a beer can on the deck of the family’s boat in New York to the puzzlement of those on board. He also remembered his sister disliking UT fraternities but devouring the beer they dispensed. His stories set the tone for Ivins’ memorial service, where those in attendance seemed determined not to focus on her passing, but on the unorthodox qualities that defined her as a friend, party girl and liberal megaphone. Can you imagine being too liberal for the New York Times? I met her in 1982 at Times Mirror‘s Dallas Times Herald. I was in my early twenties, fresh out of college and as promotion manager, advertised the super stars like Ivans. She was the headliner of the LA Time’s liberal journalism expansion into Dallas, Houston and Denver. She got top billing. Her face was on billboards and the sides of delivery trucks, and her quotes in radio ads. Her left wing, in-your-face rants may have helped sink each of those “left coast” papers in time. Only the Denver Post survives today, because of a Joint Operating Agreement for failing newspapers, with the Rocky Mountain News. Correction: The Times Herald didn’t fold. It was purchased by the Dallas Morning News and turned into a parking lot. It wasn’t Ms. Ivan’s fault. Her anti-American rants is what she did. Her attacks on Ronald Reagan and the conservative values of Dallas readers caused a mass exodus of circulation and advertisers from the Times Herald to the Morning News. The same thing happened in Houston and Denver. Who knew? Editors still don’t get it. The Minneapolis Tribune hired her as its first female police beat reporter, and she claimed one of her proudest moments of her journalism career was when the department named its mascot – a pig – in her honor. Funny stuff. By the way, The Minneapolis Tribune, a well-known liberal New York Times wannabe, and was dumped off on private investors just a month ago. It wasn’t the publisher’s fault, Thomas McCartin at the Times Herald was a Times Mirror Company (TMC) man all the way. His initials (TMC) allowed him to have custom monograms on his cuffs, stenciled into glass doors and in the marble. McCartin wouldn’t argue with Otis Chandler’s top editors’ plans. It was the editorial executives who had the vision that a socialist, poison pen columnist would increase readership in conservative Texas and Colorado. They were out to show the establishment who was boss. Tom McCartin was a marketing, community events promoter of “Dallas, City of The Arts” and jazzy new sections publisher. He switched the paper from a blue collar afternoon paper to a morning, middle- and upper-middle class paper (on the surface) through promotion, almost overnight. He may have known about the liberal-snob link before the rest of the mainstream media. McCartin was a marketing genius. He didn’t dwell on the leftist takeover of the Times Herald’s editorial department. He was used to that, having worked at the LA Times and for a time, the Washington Post. 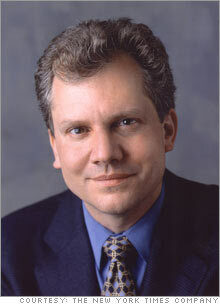 Ken Johnson, the executive editor of the Dallas Times Herald also came from the Washington Post. David Broder — the famous lefty who is a regular on “Face the Nation” and other Sunday morning political shows actually had an office at the Times Herald for a stint. I promoted him too. We had a party at the downtown Dallas paper where liberal heavy hitters gathered. I even have a picture of me with Martha Graham, publisher/owner of the Washington Post. But I digress. Johnson “knew” that Ivins was his kind of journalist. The editorial department was well funded at this boom time and there were layers of managing editors. …There were six or seven assistant city editors, a city editor and half a dozen people with the words “managing editor” somewhere in their titles sitting around the desk. No one moved. There was a long silence, They all kept their eyes glued to each other or to their computer screens. I refused to move. I waited. Finally one of them whirled around and held up his hands before his face with the two index fingers in the sign of the cross, in the gesture used to ward off vampires. Schutze was showing a friend that he was free to print anything he wanted and attack the big shots at will. That’s the environment that Molly Ivins worked in for a few years, anyway. The paper’s enemies — and even some of its liberal friends in the Democrat and black communities — closed in on the Times Herald editorial slant. There were jabs by Ivins and others about “lavish holiday parties” by builders who were overcharging for their new homes, the same story on the evil new car dealers. The home builders and auto dealers simply pulled their advertising from the Times Herald and put it in the more conservative Morning News. As ad revenues fell, editors were less able to defend the journalist “foot soldiers” from the Dallas establishment’s heavy weights. In 1984, the paper finally gave in to critics and Molly Ivins was kicked-off the metro section front page. Molly was still allowed a fairly visible spot on the Op Ed Page, but she had to get out of Dallas and move to Austin and she had to stop writing about the business leaders in Dallas. Ken Johnson left with a golden handshake from McCartin and Chandler and started a chain of weekly newspapers called Westward Communications. That chain actually got back to basics and covered local news. Johnson learned his lessson about letting the rabid left wingers destroy the advertising base. Ivans was a diehard liberal. She boasted about that. She was at nearly all the fancy fundraisers with her gal pal, the former governor, Ann Richards. She hung out at with Dan Rather and Jim Hightower at fundraisers in lawyers private mansions around Texas. Ivins had a reputation as something of a partyer, and, until her health declined, she hosted at her Austin home monthly gatherings of writers, Marxists, druggies and rabble-rousers. She was a colorful writer. It’s just too bad she didn’t spread some of her talent and power of the press to attacks on LBJ, Jimmy Carter, Ann Richards, Hilly and Bill Clinton. Maybe the Houston Post and Dallas Times Herald would still be around today. Ivans was actually born in Carmel-Monterey, California and grew up in Houston’s River Oaks. (That’s where Ken Lay used to live). She attended Smith College, her mother’s and grandmother’s alma mater. Her father was a rich corporate lawyer and a Republican. She put on persona that she came from the piney woods of East Texas. Now you know that she has a lot in common with Democrat leaders, Nancy Pelosi, Barbara Boxer, Diane Fienstien, Teddy Kennedy, perhaps even fed with a silver spoon. She missed her calling, that was some act she put on. RIP. Visit the Wonkette to see a liberal point of view. Like which conservative columnist should die next.